The above quotation is from the website of Working Dogs for Conservation (WD4C), a Montana-based organization whose dog teams literally travel the globe helping to save endangered species, find and route out invasive species, and intercept contraband cargo that includes products from endangered animals. The coolest … okay, one of many, many cool aspects of their work is that the dogs they train are the “bad” dogs who wind up in shelters because no one can handle them. No regular family or ordinary adopter, that is. The high-energy, obsessive dogs who will do anything, anything at all, for the chance to play one more game of tug or get that silly human to throw the ball. Even better, the organization reaches out to shelters and teaches staff how to recognize these high-drive dogs and connect them with organizations, like Working Dogs for Conservation — or police, military, search and rescue, or other organizations that train and work detection dogs. WD4C offers living proof that dogs can master more than one job. The dogs — endlessly trainable, remember — are taught to detect multiple, maybe dozens, of scents. That makes them versatile partners and enables teams to work in all kinds of places. The dogs learn to detect scents underwater as well as on land. In the water, they can detect pollutants like metals or pharmaceuticals, and they can distinguish between species of fish and aquatic plants, to identify invaders. At a talk I recently attended, the research director, Megan Parker, said that the dogs could distinguish between rainbow trout and brown trout, a feat that many Montanans would find impossible. They’re currently teaching dogs to detect brucellosis, a highly bacterial infection that affects, among others, cattle, bison, and elk in Montana. In the service dog world, I’ve heard people claim that a single dog couldn’t be trained to, say, guide a person with impaired vision and retrieve dropped items; that person would need two service dogs. I’ve heard pet owners (and, sadly, pet trainers) claim that dogs can’t learn different rules for different situations or understand tasks that are too similar. This is absurd, of course. So maybe the best thing about WD4C is that it believes in dogs: It believes in dogs’ ability to constantly learn — the demo dog at the talk is a 12-year-old Malinois who has been working for 11+ years. He’s still learning new tasks. It believes in the hard-to-handle dogs that others write off — and saves many of them from certain death in shelters. 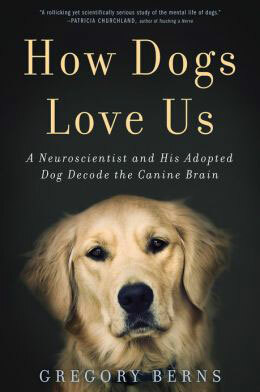 It even believes in humans’ ability to learn about dogs, sharing training methods and research with organizations and individuals who are eager to understand how incredibly capable dogs are — and to teach them to use their noses in countless ways. Who’s a [Good, Bad, Anxious, Happy, Aggressive, Calm] Dog? I recently attended a two-day workshop with TTouch practitioner Lori Stevens. Of the many tips and techniques that stuck with me, this stands out: We tend to label dogs’ behavior rather than describe it. What is an anxious dog? What is an aggressive dog? A well-behaved dog? Turns out that each dog owner — and dog professional — means something different when she uses those terms. I sometimes describe Jana as “anxious” because, many evenings, she seems unsettled, distracted, and uncomfortable. She whines or paces, but I can usually settle her down in a few minutes. The technique I learned from Lori, using a body wrap, seems to help a little. Jana also shows what I call anxiety on walks if a vehicle (mostly loud, big trucks, though she seems to harbor a deep-seated hatred of minivans, too) approaches from behind us and startles us. I attribute some of this “anxiety” to the possibility that she’s not hearing things as well as she used to and she gets surprised more often — perhaps she’s also losing some vision. Whatever the cause, things seem to come out of nowhere and startle her more often. Fine, so, she’s a bit anxious and I deal with it. But I have friends whose “anxious” dogs have done hundreds of dollars in damage to their possessions, their floors and walls, their furniture … other “anxious” dogs bark nonstop or are unable to sleep through the night (pacing, whining or barking, and ensuring that no one in the household gets any sleep. Ever.). Compared with that, Jana is calm and placid, well-adjusted even. Then there’s the “aggressive” dog. I’ve seen dogs who have been labeled as aggressive who are the sweetest, friendliest dogs … but who really dislike cats and want to chase them (or worse). Or who have maybe bitten a person, once, under what turns out (if I get the whole story) to be extreme provocation. Or who are simply terrified, stressed by being put in a situation that they cannot handle. Not all of these dogs are aggressive; they are scared and overwhelmed. Scared and overwhelmed can be fixed; prey drive can be managed. But some dyed-in-the-wool, born-with-it aggression is not fixable and can be very hard to manage. It is important to know the difference. Being able to describe our dogs’ behavior accurately and in detail is important for so many reasons. We can do a better job of figuring out how to manage or change that behavior if we know what it is and why it’s happening. As dog professionals, or as dog owners who want to call in a professional, a clear, detailed description of behavior is an essential starting point — does this dog need training? Medication? Treatment for some underlying, painful condition that is causing her to snap at people? Sometimes the cause is simple, even if it’s not immediately obvious. A couple of summers ago, one evening, Jana snapped at Cali for playing roughly near her. Jana is usually amazingly patient with Cali. I reprimanded Jana for her “aggressive” act. Fortunately, within a few days, Jana was scheduled to have her annual physical. At her vet exam, the doctor found that Jana had a very painful cracked molar. A long surgery and several hundred dollars later, Jana was no longer in pain. She has never snapped at Cali again. So, trash the catch-all labels. Instead, look at the behavior. When does it happen? Is there a trigger? Did it just start? Has behavior changed recently? Has the dog’s environment changed? Is the dog getting enough exercise, a balanced diet, regular medical checkups? If you can’t figure out the cause, call in help: doggy friends, the vet, a trainer. 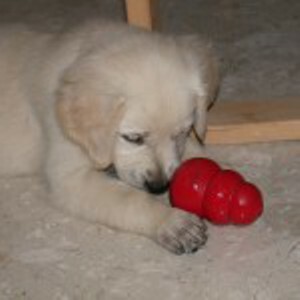 Post a question on the Thinking Dog Blog! It’s usually possible to figure out what’s going on — and lots of expert help is available! 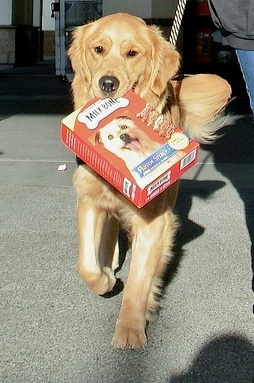 A reader writes: My spouse, the “good” parent, gives our dog lots of treats. Now the dog has become a tyrant, especially when I’m trying to make dinner. Other than saying NO when she has maxed out her quota and then having to deal with nagging, or else yelling at this sensitive dog and becoming even more of the “bad” parent, what might you suggest? This is a tough one, as is any instance where spouses’ parenting styles clash. A couple of hints in your question suggest an area where I think you can make changes, though. One is your characterization of yourself as the “bad” mom, simply because you are a tiny bit more strict. And what, exactly, is her “quota”? Together, these tell me that you and your spouse, like many dog parents, equate giving treats with giving (or, perhaps, getting) love. And a nice mom (or dad) gives lots of treats while a mean mom stints on the cookies. That’s simply not true, regardless of what the dog says or how sadly she looks at you. One place to start might be to not give any treats without a reason. That’s not as mean or as hard as it sounds. And even if you can’t get your spouse on board, you can convince the dog that making sad puppy eyes at you will not get her anywhere (and neither will “nagging,” whatever form it takes). Come up with your own criteria. I ask that my dogs do something, bring me something, or submit to something they dislike in order to earn treats. This translates to cookies for bringing me the paper or my shoes or for picking up their bowls after eating; treats for coming in, sitting nicely, and stopping their insane barking when the neighbors walk by with their dog; and high-value treats for allowing me to do their nails and other hated grooming chores. Some people set the bar lower, giving the dog a treat each time she comes in from going out to pee, for example. While I see no reason to do that, it does, at least, set a criterion. You do X, you get a cookie. That sets up a different expectation than: I am (or I am cute); therefore I deserve a cookie. If all that seems too complicated, any time she bugs you for a treat, ask her to do something she already knows: sit and shake hands; roll over; high five. She will still be exchanging something for the treat, not just walking by and expecting rewards simply for existing. Of course, she is not going to accept this new regimen without protest. You’ll need to hold firm for a few days or a week or so, ignoring her nagging, and she will ultimately resign herself to having to earn or pay for her rewards, just like the rest of us. She might still get freebies from your spouse — you probably can’t change that. But I seriously doubt that your dog measures her love for each of you by the number of free treats you hand out. A lot more goes into building a relationship than that! I am teaching a class where students attempt to analyze dog-human relationships from the dog’s perspective. I asked them to think about what dogs would want the world to look like — what dogs dream of, what the future would look like if dogs’ perspectives were given equal weight to humans’. We also looked at what several writers and editors have published as their versions of dogs’ dreams, hopes, and aspirations. Looking at the work was informative. Much of the published work that claims to represent a canine viewpoint is undeniably anthropomorphic. Products, too — though designed for dogs, they are things that no dog would ever want. Shampoo with an overpowering, sweet fruity scent, for example. Or Dog TV, a channel created for your dog to watch while he’s at home all day. It’s carried by several cable companies. Several of the examples we looked at described dogs’ desire to have thumbs so that they could control the remote or their desire to lie around dreaming all day. Dog TV was created for people who see dogs as furry little couch potatoes. Another common theme is taking charge. 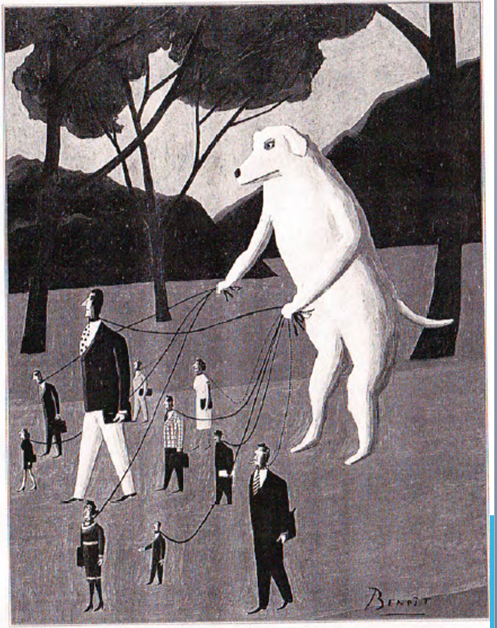 One image from 21st Century Dog, a collection of dog-centered prophesies, appears below. 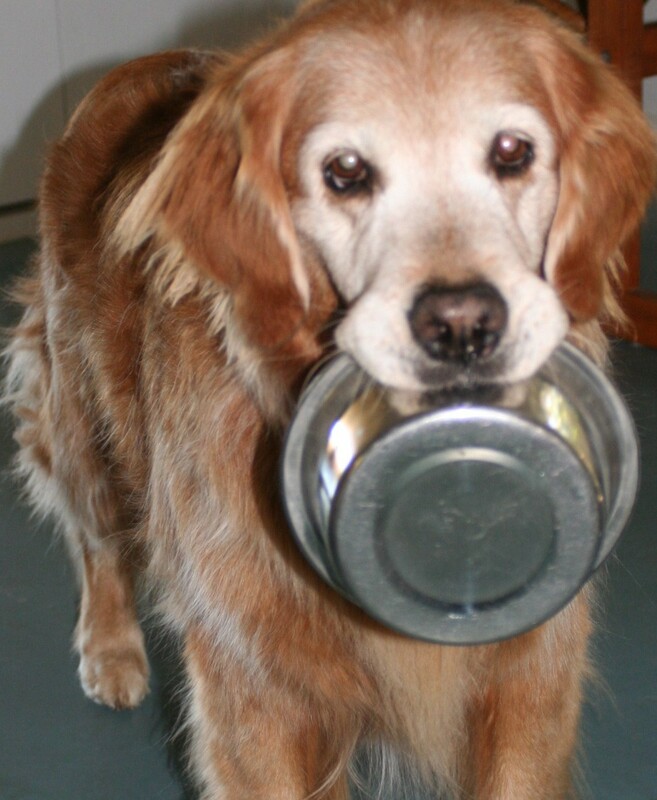 In a similar vein, several students channeled dogs who lived in a leash-free world where humans addressed their every whim or in homes where the dogs ate at the table while the humans curled up underneath. But, benefitting from an in-depth understanding of dog behavior, relative expertise on dogs’ health, well-being and psychology, and lives immersed in all things dog, several students’ views of dogs’ desires seem to get closer to what dos might, actually want. In a book that illustrates dogs’ dreams, dogs dream of large, ornate houses, trips to Paris, and huge collections of shoes. Not likely, unless those shoes were for chewing. Yet all is not lost to the hapless dreaming dog. Several students’ dogs dreamed of more doggy things — endless balls, growing on plants in their yard; freely available and dog-appropriate food (they are also studying canine nutrition); being free to dig, roll in the mud, and drink from a bottomless water bowl; enjoying a private stream where they could catch fresh fish. Others envisioned a world where, rather than one species ruling another, the partnership was more even. Humans would understand their language and they’d get as much attention and company as they wanted. Dogs would not have to wear clothes; could go out to pee whenever they chose; would not be forced to interact with dogs whom they disliked; and bed-sharing would be negotiated. One student nailed it by focusing on scent … another imagined dogs having the right to work in fulfilling jobs. While we’ll never know for sure whether dogs dream of taking over or simply of a more equitable partnership with us, we can be sure that most dogs — like most people — want to use their intelligence and be challenged physically and mentally. Then, tired and muddy, we can all stretch out on the couch and fight over the remote. Puppies, like babies, are born with the potential to learn and problem solve and think. They are innately curious and begin investigating their world even before they open their eyes. Our job is to develop these skills in our puppies and dogs by providing opportunities for them to learn and develop their conceptual thinking abilities. We can expose them to lots of novel items and situations and provide encouragement and motivation. We can also be on the lookout — especially with puppies — for opportunities to turn potential problem behaviors into desirable, adorable, and even helpful skills! Dogs who are taught, especially by handlers who use methods that encourage problem-solving, become better problem-solvers. A study called “Does training make you smarter?” compared dogs who had received training with dogs who had not. Dogs who had received training solved a problem — opening a box that had a pad that could be pressed by the dog’s paw — spent more time trying to open the box (and were less likely to seek help from their owners) than dogs who had no formal education. The study’s authors speculate that trained dogs have “learned to learn” in a way that unschooled dogs have not. But, and this is a big but — not all education is equal. There are many approaches to teaching or training, and the methods you choose will affect more than just how fast your dog learns — it can affect the bond between you and your dog, and it can shape or reflect your attitudes toward dogs. And it’s not just the method. The words matter, too. I make a distinction between training dogs and teaching them because I think the word choice reflects a difference in attitude and goals. Training dogs is what I call educational approaches that are narrowly focused on eliciting specific reactions to cues or commands. The trainer has a clear end result in mind for each command. The trainer says, “sit;” the dog sits. Practice emphasizes precision of the dog’s response, speed of the response, and the dog’s ability to respond quickly and precisely even when distractions are present. When I refer to teaching, on the other hand, I am referring to a process that develops the dog’s thinking and problem-solving abilities. The teacher’s goal is to give his or her students the tools and the confidence to figure out what to do in a variety of situations. Sometimes, a teacher might seek a precise response, like the sit; other times, the teacher makes a request that requires the dog to figure out what to do. “Find a pen” gives the dog a goal but no precise instructions for reaching that goal. Teaching brings the dog to a level of independent thought and problem solving that enables him to respond to a command or cue that is as vaguely defined as “find a pen;” training does not. Any approach to training or teaching is based on an underlying mindset or set of assumptions: assumptions about what dogs are capable of learning; assumptions about how dogs learn and how much of what we say and do they actually understand; and assumptions about what the dog-person relationship should be. Trainers who do not believe that dogs are capable or reasoning or problem-solving are unlikely to put any effort into developing these skills in the dogs they train. Trainers or handlers who believe the dog’s “job” is to be obedient and submissive are unlikely to tolerate a free-thinking dog. Some trainers talk about “getting dominance” or “being the alpha” as ways to ensure that dogs remain obedient and submissive. Methods of dog “training” or education can be placed on a continuum that ranges from those that do not encourage the dog to think at all to those that practically make the dog do all of the thinking. The Thinking Dog blog will teach you to recognize various approaches and their goals — and encourage and equip you to explore methods that help your dog become the best thinking dog he or she can be.